I’ve tracked 700 shots this summer and the biggest change I’ve noticed is that I’m more consistent than I was in the beginning. For example, my first four scores were 16, 9, 17 and 8. Now I hover much closer to 17 with a couple really good rounds mixed in. My record is 22 and I feel like it will be a long time before I beat that, but I’ll keep going and see what happens. The trend is going up, but if you take out those first four rounds, the slope of the line is still positive but much shallower. I don’t have data for this, but it feels like I usually get better as the round of 25 goes on. So would my average go up if I did more in each round? I might mess with the experiment a little bit too and change to either “how many shots does it take to make 25” or just “how many did I make out of 50”. Mentally I’ve been comparing this to trap shooting. Both use rounds of 25 and both have a big mental factor once you learn the basic physical skills. 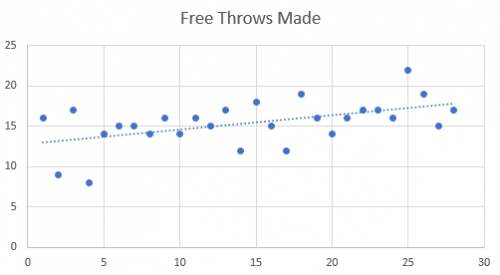 At this point, I’d say that free throw shooting is harder than trap shooting which seems crazy to me thinking about the physics of it. But the number of free throws shot over my life is dramatically higher than the number of clay birds I’ve broken and yet, my trap shooting scores are generally better than my free throw scores. I also believe that if you look at professional trap shooters, they have higher success percentages than professional basketball players shooting free throws.